According to the website, the list includes the total number of closings and the top ten builders in each market, ranked by their 2016 closings and market share. Houston-The Woodlands-Sugar Land and Dallas-Fort Worth-Arlington swapped spots on this year’s list, with Houston ranking at No. 2 and Dallas moving up to the top spot. 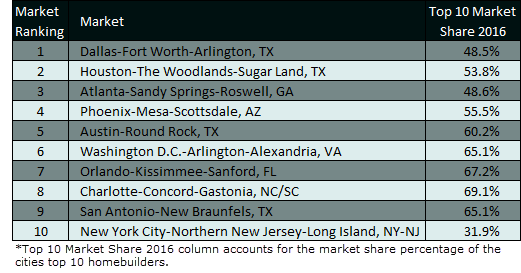 Austin-Round Rock and San Antonio-New Braunfels also made the top 10 ranking at No. 5 and N​o. 9, respectively. According to the latest estimates from the U.S. Census Bureau, more than 18,666 new residents were added to Houston between July 1, 2015 and July 1, 2016. Conroe, Texas specifically saw the highest percentage growth in that period with a 7.8 percent growth, more than 11 times the nation’s average. ​​Check out Austin​, DFW, Houston, and San Antonio​ Housing Market Research.